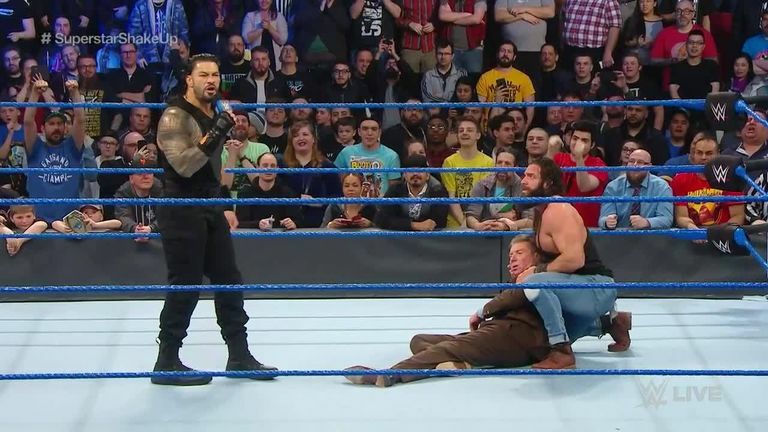 Roman Reigns marked his SmackDown arrival in style - decking Vince McMahon with a Superman punch! Roman Reigns was not the signing Vince McMahon had promised to make for SmackDown but he still made a huge impact on his blue brand debut. Prior to the show, McMahon had promised to bring in "the biggest signing in SmackDown history", which he revealed to be the guitar-playing antagonist Elias. That prompted a mixed response from the Montreal crowd but their confusion turned to cheers moments later when Reigns' music played and 'the Big Dog' made his presence felt. First he laid out Elias with a Superman punch before giving one to the 73-year-old McMahon for good measure and announcing SmackDown is his "yard" now. Reigns wasn't finished there either. After briefly contemplating a return to the dressing room, he ran back to the ring and hit Elias with a huge Spear to the delight of the fans. Paige revealed the tag team she will be pitted against women's champions The IIconics, with former NXT title-holder Kairi Sane being paired with fellow Japanese star Asuka. Sane's arrival completed a major bolstering of the SmackDown women's division, with former world champion Bayley, Ember Moon and Liv Morgan being brought across. Bayley and Moon were then partnered with Sane and Asuka for an eight-woman tag match against the IIconics, Mandy Rose and Peyton Royce to mark their arrival with a win. Sane picked up the pin after a picture-perfect Insane Elbow on Peyton Royce. The Intercontinental title is now a SmackDown championship after Finn Balor moved across from Raw as the blue brand's first acquisition in the Superstar Shake-up. WATCH: Best of the Raw Shake-up! Balor wasted no time getting down to action by taking on Ali in a non-title bout which featured plenty of high-octane action. Ali appeared to have The Extraordinary Man reeling when he connected with a dazzling top-rope hurricanrana, but Balor dodged Ali's 054, nailed a running dropkick and clinched the win with the Coup De Grace.